Today’s systems typically work by using stainless steel fittings that are counter sunk into recesses in the corners of the glass to allow strengthened panes to stand otherwise unsupported. The glass is fixed to the structure of the building itself rather than being fitted with traditional and sometimes view-restricting frames. Glass-fin (mullion) units are among the most popular structural glazing systems specified where a seamless finish is required. This is because such products eliminate the need for traditional metal mullions, which can restrict the view from inside a building. 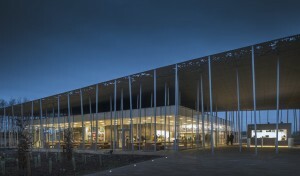 Pilkington Planar™ was used when building the new Stonehenge visitor centre. Installers from Vitrine Systems worked to the brief to create a building that blended unobtrusively into the wide-open Wilshire landscape.